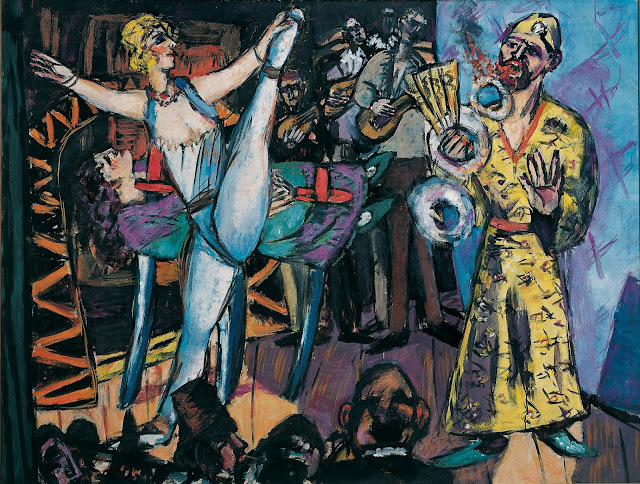 From the early 1920s the work of Max Beckmann (1884–1950) was characterized by motifs dealing with performers. For Beckmann, the world of vaudeville and fun fair acts, acrobats, clowns, and actors was an expression of a metaphorical concept of human relationships and world events. 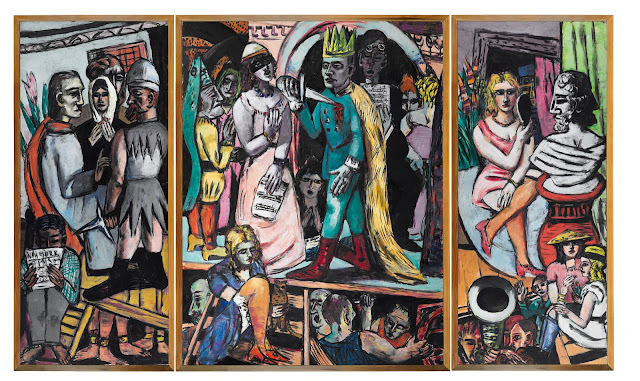 Max Beckmann: Welttheater (The World as a Stage) is the first exhibition to focus on this central theme in the work of the painter, which is highly relevant to us today in light of current media developments. The show brings together 112 loans from museums and private collections in Germany and abroad, including masterpieces which have rarely been displayed in Europe. Max Beckmann is one of the exceptional painters of Modern Art. In the 1920s he was associated with New Objectivity. 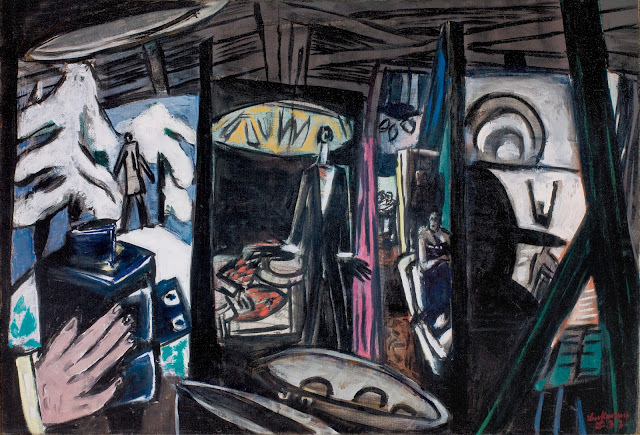 Later, he was classified as an Expressionist, a movement that received early international notice, through his use of black contours and glowing colors. Many of his famous triptychs are held in museums in the USA, including Actors which to date has been rarely displayed in Europe. This work forms the focus of the new exhibition at the Museum Barberini, showcasing Beckmann’s idea of the world as a stage. 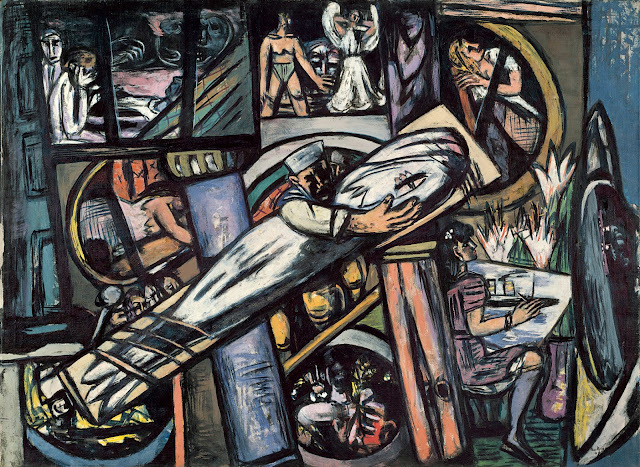 The World as a Stage as a Symbol of Current Events Max Beckmann’s paintings, sculptures, and prints frequently depict scenes that occur on stage or behind the scenes. These include vaudeville and circus acts, actors in their dressing rooms, or showmen at fun fairs. 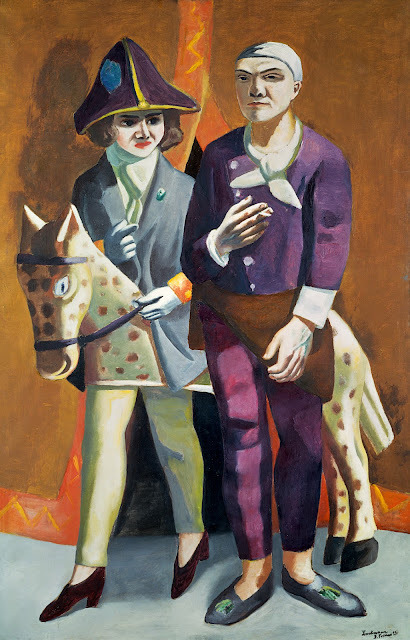 In addition, Beckmann created self-portraits showing himself in the guise of a clown or performer. Picasso also placed artists among travelling performers to demonstrate how they were able to turn their unerring gaze on humanity from the margins of society. For Beckmann, the role of spectator was also an opportunity to comment on world events and process his own personal experiences. The painter felt obligated to be a fair-minded commentator, a contemporary who aspired to illustrate life on the streets and reveal social discrepancies. He had observed great suffering as a medic in the First World War. He belonged to a generation that had lost its belief in the governing order. 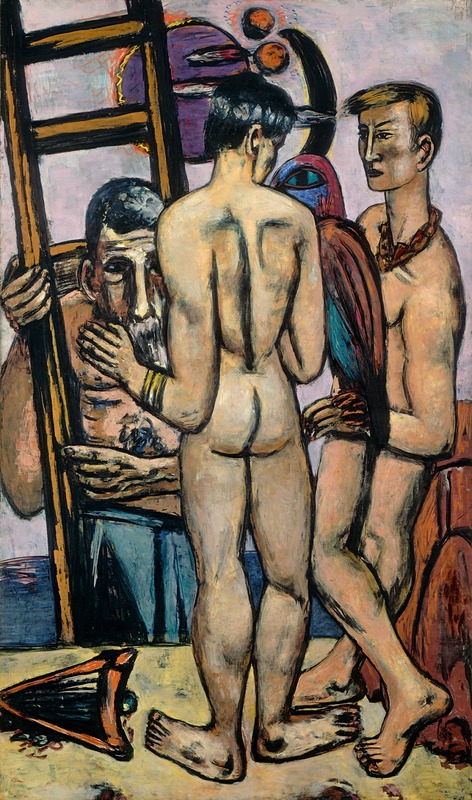 They called into question personal sovereignty, which Beckmann expressed in the figure of the fool. With this comparison, he captured the essence of a generation that had experienced little choice in their fate and who questioned the notion of free will. 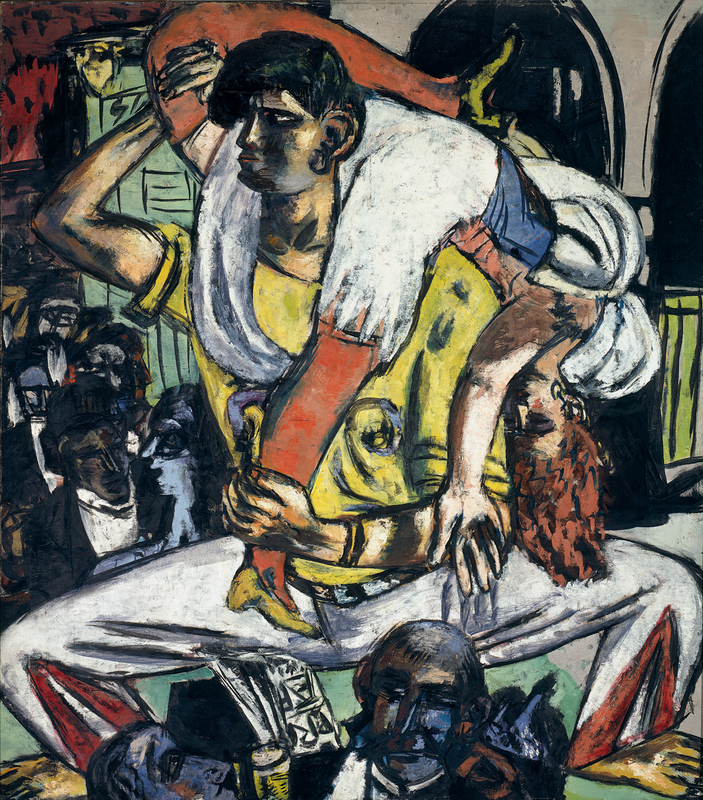 In light of his personal experiences and the dramatic events taking place on the world stage – in 1933 he was dismissed from his teaching position at the Städelschule in Frankfurt, in 1937 he went into exile in Amsterdam – Beckmann viewed the world as a stage that symbolized current events. He searched for truth behind the masquerade. Circuses and the theater provided him with a template: Life is a balancing act for everyone – not just trapeze artists, and actors are not the only ones who play various roles. 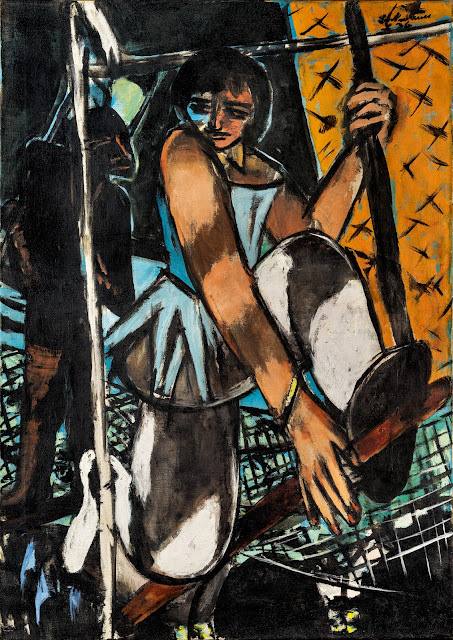 The exhibition brings together 112 loans from museums and private collections in Germany and abroad including the Nationalgalerie in Berlin, the Kunstsammlung Nordrhein-Westfalen, Düsseldorf, Museum Ludwig, Cologne, the Tate, London, and the Saint Louis Art Museum. 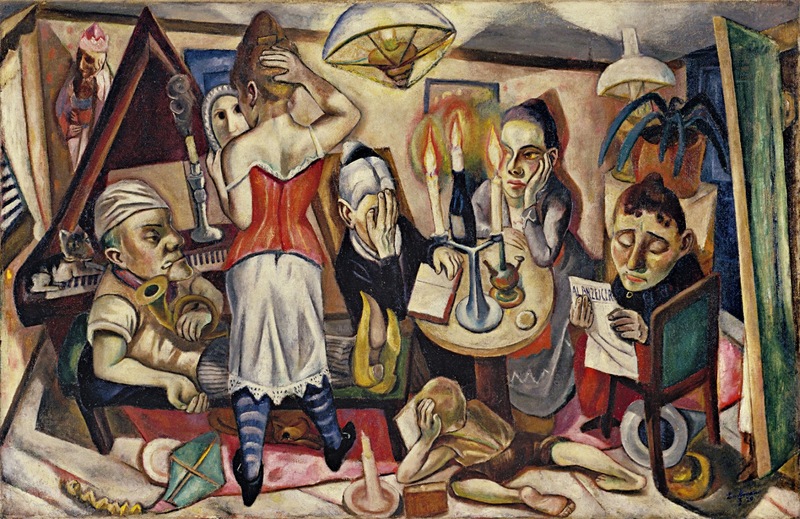 The exhibition is held in cooperation with the Kunsthalle Bremen, which has one of the largest Beckmann collections in Germany.